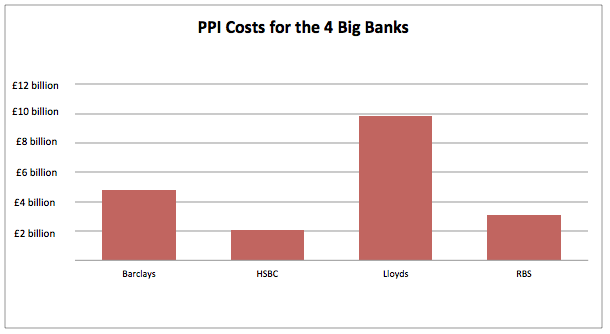 How much have the big 4 banks set aside for PPI claims? Following an announcement from Barclays a few days ago that they’ve set aside an additional £900 million for the cost of PPI, the banking giant has now set aside £4.8 billion. But how much have the 4 major banks set aside in total to payout for the PPI mis-selling scandal. The bill for Lloyds looks set to be almost as high as for the other 3 major banks all combined. (Sources: Guardian and Financial Times). This leaves the total pot put aside by the UK’s 4 biggest banks at £19.83 billion. Massive. And there’s no guarantee this figure won’t end up increasing over time. Posted on August 7th, 2014 in Reclaim.